When I was a young girl, I used to love to go and get ice cream from Dairy Queen with my Aunt Emily. She still teases me that I used to call ice cream “cream con cuchara” – loosely translated to “ice cream with a spoon”. Nowadays whenever I go to Dairy Queen it is to get their Crispy Chicken Salad rather than ice cream. If you haven’t had this salad, you need to try it. It is the perfect blend of ingredients to make a simple salad so delicious. I wanted to recreate the salad at home with baked chicken tenders, but i just couldn’t do it. This salad calls for crispy chicken tenders. That and the honey mustard dressing are what make this so scrumptious. Well, that plus the bacon! I ended up using The Pioneer Woman’s recipe as the base for the chicken strips and honey those things were so good. I’ll definitely be making these for my tenders-loving niece and nephews the next time I am home. My chicken came in a pack with bell peppers and onions so I fried those up in the same mixture first so I could have a little snack while the tenders were cooking up. Yummy. 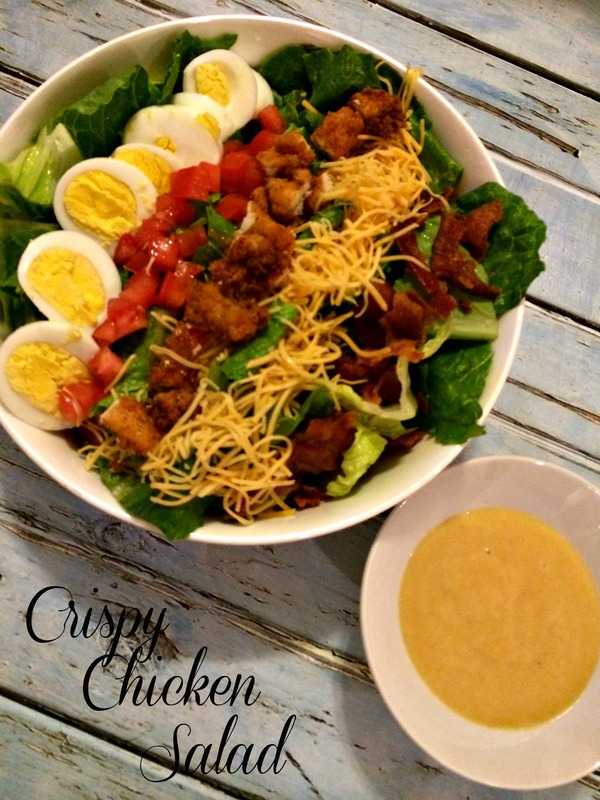 I hope you enjoy my version of this Crispy Chicken Salad. Add chicken strips to buttermilk. Let sit for 15-20 minutes. In a mixing bowl, add flour, seasoning salt, garlic powder, smoked paprika and pepper. Mix together. Add 3 Tbsp buttermilk to the flour and mix together to make a chunky mixture. Add enough oil to come up about 1 inch in a large cast iron skillet. Heat on medium-high heat. Add chicken pieces to flour and coat thoroughly. Once oil is ready (when a little bit of the flour added starts sizzling), add chicken pieces in batches. Cook for about 1 1/2 minutes per side or until chicken is golden and crispy. Remove from oil and place on a paper-towel lined plate. To make salad dressing, in a small bowl combine mayonnaise, mustard and honey. Whisk to mix together. 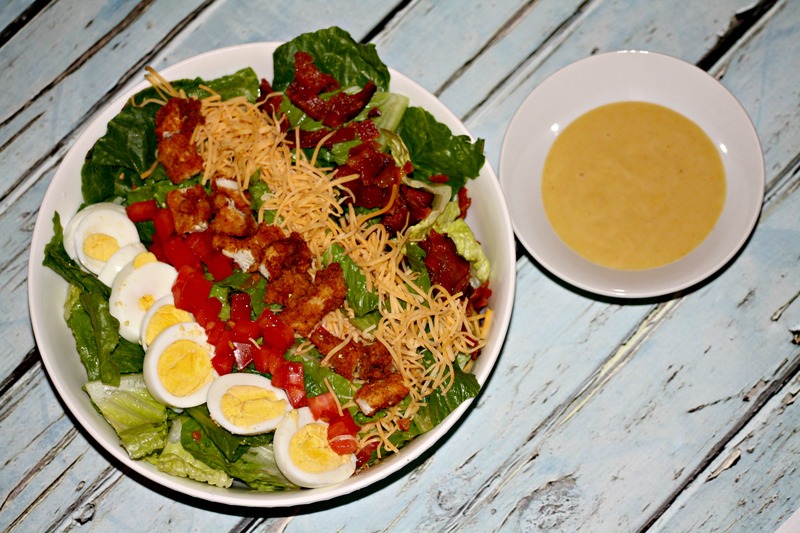 To prepare the salad, add the diced romaine letter along with bacon, tomatoes, eggs, cheese and chicken. Add honey mustard dressing and toss to coat.